OMAHA, Neb.--(BUSINESS WIRE)--After the successful launch of its first WeChat experience in Hong Kong in August, TD Ameritrade Holding Corporation (Nasdaq: AMTD) is now bringing investor education, financial market updates, and research to retail investors in the United States through WeChat, also known as Weixin in China, which recently hit 1 billion monthly active users.1 Powered by artificial intelligence (AI) and backed by live client service support, users can now do their research, access the markets and get support through the popular Chinese social and messaging platform. TD Ameritrade is the first U.S. brokerage firm to launch this kind of service on WeChat. “TD Ameritrade joins thousands of renowned brands that are already using the power of WeChat's scale and unique features to enhance customer engagement and service. WeChat has been expanding its offering globally, and we are very excited that TD Ameritrade is using WeChat to bring our unrivaled convenience and accessibility to its customers," said Juliet Zhu, general manager and head of WeChat Marketing at Tencent. Get updates on U.S. markets, indices, sectors, currencies and futures. Get a quote, track company events or trends. Learn about investing with educational videos and get answers to frequently asked questions. Utilize WeChat’s unique ‘Shake’ feature to help discover and watch relevant education content. Check account balances and positions. Chat with an automated agent or a live agent any time. Set up proactive push notifications. Access TD Ameritrade’s Mini Program within the WeChat platform to seamlessly begin opening a TD Ameritrade account. Locate a nearby TD Ameritrade branch and schedule an appointment with a financial consultant. Consumers can similarly connect with TD Ameritrade through third-party platforms including Facebook Messenger, Amazon Alexa, Apple Business Chat and Twitter Direct Message. 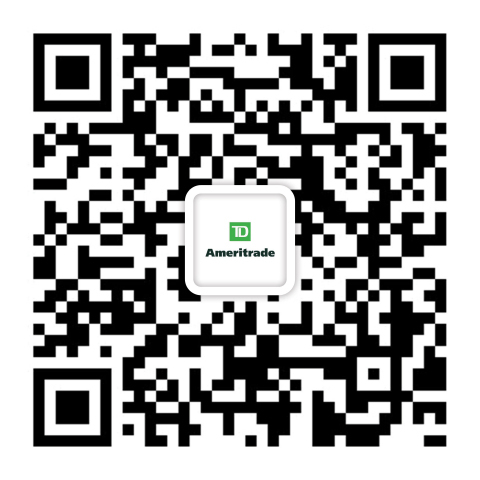 Scan the QR Code to connect with TD Ameritrade on WeChat. TD Ameritrade provides investing services and education to more than 11 million client accounts totaling approximately $1.3 trillion in assets, and custodial services to more than 6,000 registered investment advisors. We are a leader in U.S. retail trading, executing an average of approximately 800,000 trades per day for our clients, more than a quarter of which come from mobile devices. We have a proud history of innovation, dating back to our start in 1975, and today our team of nearly 10,000-strong is committed to carrying it forward. Together, we are leveraging the latest in cutting edge technologies and one-on-one client care to transform lives, and investing, for the better. Learn more by visiting TD Ameritrade’s newsroom at www.amtd.com, or read our stories at Fresh Accounts. Third party firms mentioned above are separate from and not affiliated with TD Ameritrade, which is not responsible for their services or policies.